Have you always loved the natural look of wood shutters, but the price point was just too darn high? Well we found the perfect alternative and recommend ALLView Shutters because they are durable, sustainable, and available in multiple elegant designs for your home. This product gives the same wood vinyl feel, without over the top prices for real wood. Not only are the ALLView shutters a great wood alternative, but they are also one of the popular trends in window treatments for 2015. In this article, we will introduce the benefits of ALLView shutters, key product characteristics, and suggests for the best fitting areas of your home. Watch our very own O’D McKewan give a demonstration of this new innovation. ALLView is manufactured by US Polymers, a leading window covering manufacturer that has been serving the window covering industry since 1983. 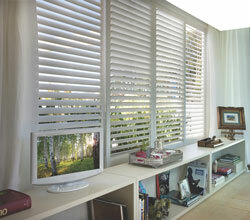 This innovation in faux wood shutters, delivers elegance in a low maintenance and eco-friendly product. With their patented, hidden rear tilter bar lets you enjoy wide open and clear louvered views outside your windows. Warm Feel – AllView’s WoodTex™ finish captures the look and feel of wood shutters. Long Lasting – Resists dents and scratches; will not warp, chip, shrink, crack, fade or peel; and is moisture resistant. Easily Cleaned – Poly resin construction is easy to clean with soap and water. Paint Free– No VOC emissions or solid waste released into the environment. MDF-Free – So you won’t have to worry about formaldehyde, a known carcinogen, out-gassing into your home. Elegant Designs– Available in sunburst, eyebrow, elliptical, half circle and more. Coordinating Frames – Arches coordinate with custom design shutter frames. No Tilt Rods – Features the clear AllView system, with no tilt rods. Pro Tip: ALLView Shutters offer added safety with no hanging cords and fire resistance. If you have children in the house, here are more options on Child Safe Window Treatments. What is the Perfect ALLView Shutter Placement? Window shutters are not right for every part of your home. We recommend these locations as the best places to install a custom shutter. Our design team has also made recommendations for window treatment ideas for doors that would help you decide on window coverings for other areas of your home. You might also be interested in Solar Shutters or WoodCore Shutters as wood alternatives. Most of the time you don’t want people looking into your home, but occasionally it’s nice to look outside and see how beautiful it is. ALLView Shutters are a great window treatment options for front of the house windows that bridge the gap between privacy and openness. They provide privacy with their louvers that close tight and accessibility with the hidden tilt rod in the back that doesn’t obstruct your view when opened. Have a unique window shape? Arched shutters are an elegant window treatment option adding curb appeal, light, and privacy control. They can also be custom crafted to fit any window space! Typically these rooms are overlooked when thinking of window treatments, but have you ever stopped to think of the level of moisture in these rooms. As stated above, a benefit of the ALLView shutters is the fact that they moisture resistant. 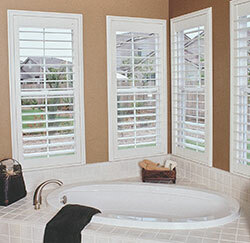 Unlike wood shutters, their hollow frame and PVC material are impervious to water damage, making them the best window treatment in rooms with high moisture. What Is the Best Shutter For You Home? 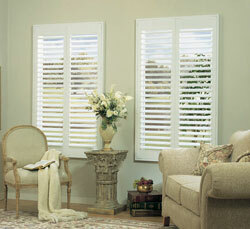 Find the perfect shutters for your home by speaking with one of our knowledgeable designers. Call us at 858.346.7468 or contact us online to schedule an appointment and choose the right vinyl shutters for your home. You can also stop by our window coverings showroom to view our large selection of Southern California window treatments.